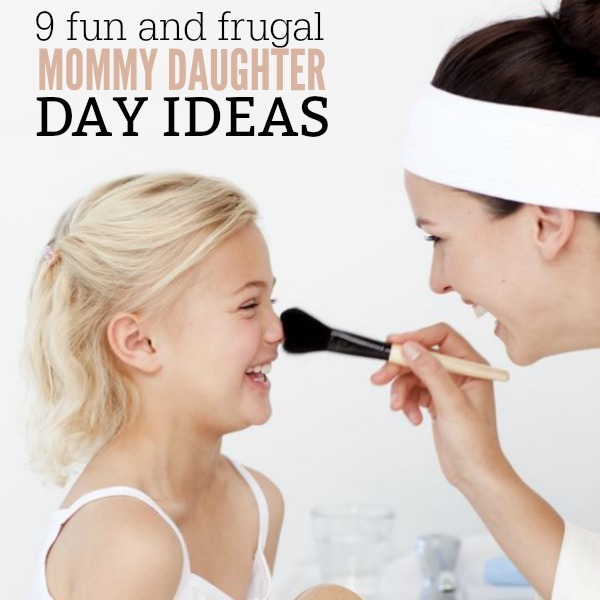 If you are looking for creative ways to spend time with your daughter, here are 9 fun and frugal mommy daughter day ideas. You will have such a special time with your precious little ones. Recently, I shared some fun ideas for dates for moms and their sons. Today, let’s talk about ideas for you and your daughter (they certainly like their one-on-one time with Mom, too!). The classic – get your nails done. If your daughter loves to feel girly, there isn’t a more classic date than going to the nail salon. Make it special by bringing snacks and stopping for Starbucks or a milkshake to enjoy while you’re at the salon. Girls love getting their make up done and they love doing Mom’s make up more. 🙂 Take an evening to stay home and play make up with your daughter. It will be one night she won’t forget. Depending where you’re located, there may be a beading/jewelry-making shop nearby where you can take a class together and have something to show for it! Just Bead Yourself in Westfield, NJ and Beadkreative in Somerville, MA are a couple of specialty shops, but Michaels also has jewelry-making (and a ton of other) classes. If your daughter is on the younger side, look into bumper bowling – they put bumpers in the gutters so she’s bound to knock down at least some pins. Many bowling alleys even have cosmic bowling with fun lights and music. Find something within a couple hour drive (a museum, a fun restaurant, etc. ), and head out bright and early one morning. Make plenty of stops along the way – anything you see that is cute, quirky, or interesting, pull off the highway and go check it out! There is so much to be seen and enjoyed, and this date allows you and your daughter to stop and smell the roses. Head to a farm or orchard. Most areas have at least one farm or orchard nearby where you can pick your own produce. Eckert’s outside of St. Louis, for example, has pick-your-own peaches, blackberries, strawberries, vegetables, apples, and pumpkins depending on the time of year. There’s nothing quite as tasty as a warm, ripe strawberry fresh from the farm! Go horseback riding or to the races. This date will be a hit if your little lady enjoys horses. Search for farms that provide trail rides or even just rides around their property. If you’re not feeling quite up to riding, look into a trip to the races instead. You may have a racetrack nearby, and you and your daughter can pick a horse to cheer for! See a play or a concert. Community theatre or a performance at a local school are cost-effective ways to introduce your daughter to live theatre without breaking the bank (plus, if she’s not into it, you can leave at intermission without feeling like you wasted money). You might just find your daughter catches the acting bug! Spending time outside is one of the best ways to clear your minds and reconnect. If you have hiking trails nearby, great! If not, head to a nearby lake or pond and just wander. It’s amazing what fresh air will do for both of you! Keep in mind that these Mother Daughter Day Ideas are interchangeable with the ones for your son. The key is to focus on your child’s interests. If your daughter loves baseball, take her to a sporting event. Do you have a son who loves to perform? Take him to a performance at a local theatre. Celebrate who your child is and what they love, and you’ll both have a wonderful time on your date! Share any mother daughter date ideas you have! We also have cheap date ideas for Summer. Most of these ideas are free or very cheap.